I recently received an email from Bee of Rasa Malaysia and Nyonya Food, inviting me to guest post in her amazing blog. Oh! Do head over there and check out her newly reconstructed design! Bee and I share something in common, well, besides cooking, speaking the same language or the love of food. We are both from our beautiful island of Penang, Malaysia. She wanted me to “cook up” a Nyonya dish. 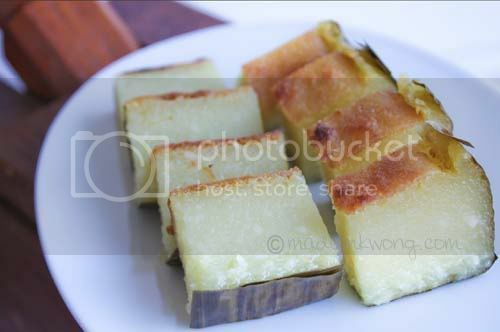 The choice of Nyonya cooking is vast and hard but this recipe is very simple. Oh! Bee did hint she wanted a kuih. So, I whipped up Kuih Bengka or Tapioca Cake. 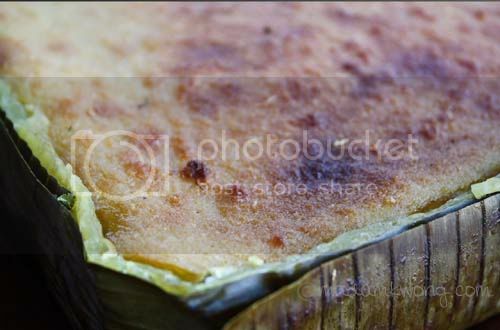 In the past where there was no electricity, Nyonyas used charcoal to bake Kuih Bengka (Cassava). The top of the kuih would become dark brown. These days, you can still get the same top crusty effect in a fan forced oven which is caused by the baking process. 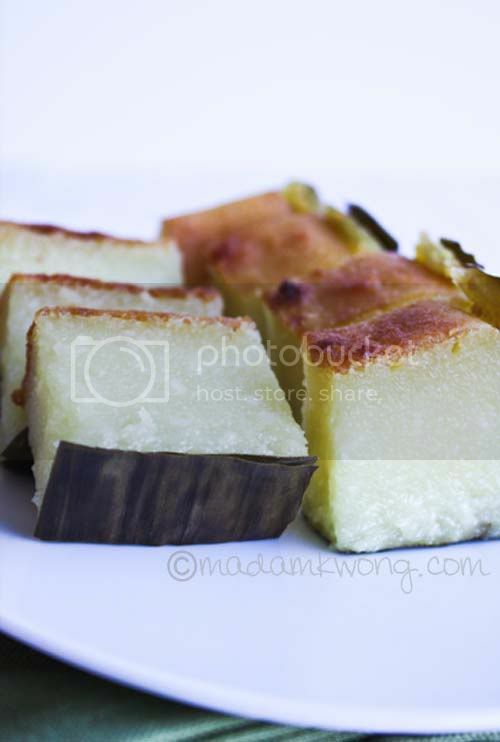 The kuih is light yellow in colour and has a sweetly scented coconut flavor. You can even bite into the grated coconut. I used the old fashion wooden coconut grater to grate the coconut in this recipe. Ahhh! Life is hard, knowing that you can buy frozen grated coconut. This is an easy recipe to make and hope you try it as well. Bake in the oven at 180 degrees Celsius for 2 hours. Mix the grated cassava, grated coconut and flour in a large mixing bowl. Heat up the coconut milk together with sugar. When the sugar starts to melt, add this mixture into the combined cassava mix. Use a balloon whisk to stir thoroughly. Lastly pour into a 8”X 8”X 3” tin, either lined with grease proof paper (baking paper) or banana leaves. Hi Mdm Kwong, Bee mentioned to me about your blog. 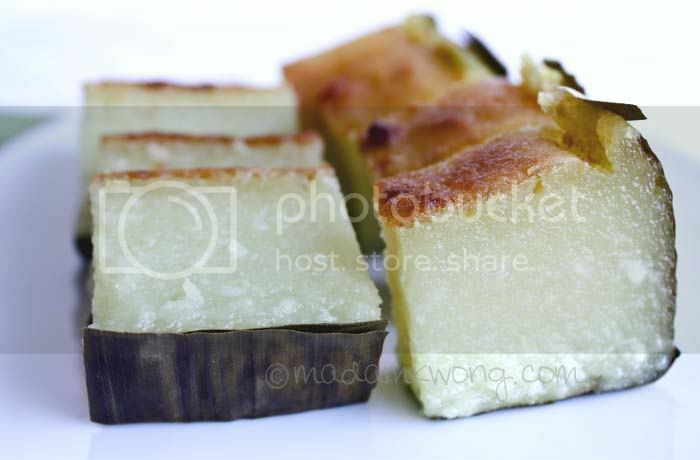 Kuih bingka is one of my all-time favorite & good to see this on nyonyafood.com! Cheers! I love Tapioca , this recipe looks amazing. By the way, i’m a fellow malaysian in Melb too!! Hello to you too, fellow Malaysian :). Thanks for visiting the blog, Aaron. You can find grated tapioca in any major Asian groceries. But ask for cassava instead. They are packed frozen from Vietnam. Thank you for visiting the blog, petite nyonya. those were the days when you need to grate coconut using the grater. i remember doing that as a child growing up in Island Park, Penang. just love your recipe, one of these weekend i will make an effort to try. kekeke…. just bought pulut inti when i was out for lunch earlier for tea! Greetings from Perth, WA. For a M’sian who spent 15 years in Canada and then moved down under a year ago, I am amazed at the abundance of Asian pastes and ingredients here. I tried the ever so easy Kueh Bengka reciepe and totally blown away at how cheap it is to make it – especially how much liquid is in the batter. Came out nice but a little too sweet. Not as yellow – which makes me wonder if the grated, frozen Cassava from Vietnam has been mixed with something else.. Thanks for the recipes. Next in line ..the yummy Yam cake. Read the title ‘easy recipes’ and I was an immediate fan. Keep posting the recipes..to keep us in touch with our roots, while away from ‘home’. Hi Nancy, great to “hear” that you’ve made the kuih bengka successfully. Yes, the Asian ingredients are abundance here in Australia. They are increasingly available. Thanks for visiting the blog. Keep me posted with your Yam cake. Hi Madam Kwong, thanks for your Kuih Bengka recipe. I have tasted a version which is steamed instead of baked. Can this recepi used for steaming as well? Thanks. My Yam cake went well too. I must say I am not the type to use exact measurements (can you post measurement by cups?) nor use the exact type flour (tell me, the difference between Mung bean flour, rice and regular flour – can I inter change – with whatever I have in the pantry?) but I got it done right the second time. Being a commercial baker in North America for 15 years have improved my ‘agak-agak’ sensors pretty well, haha. Ask me bread and I can bake you a chunky cheese bread in no time! And oh, those thick sliced chunky cheese toast ..to die for. Anyway, there you go – my update on Yam cake. I also applied similar techniques on the ‘lobak kou’ (couldn’t find the recipe) but the batter was way too watery. Made some corrections but over cooking it made it bitter. Oh well, I’ll try something else soon. Oh yes, I tried the kueh lapis and mm, not bad. However, I heard some large food manufacturers avoided red food coloring for its possible link to some health problems – so I decided not to use coloring but instead, melted dark brown sugar (which tasted like gula Melaka). Cheers. Hi Mdm Kwong your Nayonya Kuih Bengka looked really yum. I wonder if you know where to get the coconut scraper in Melbourne thanks.